In a franchise full of storied esports moments over the years, 2018 continues to break new ground for competitive Halo. Punctuated by another rousing Halo World Championship that provided an incredible fan experience, HCS London adds another feather in 2018’s cap by showcasing the largest European Halo prize pool ever and the first pro global open on foreign soil in series history. The specter of North American squads not holding the home field advantage creates a litany of intriguing storylines and lingering questions. Will travel and time-zone transitions put top teams at a big enough disadvantage to shake things up? How will the European teams respond to the sudden need to defend their own house? The answers to these musings and more lie ready and waiting to be unearthed as the Halo Championship Series returns to the magnificent Gfinity Arena for a monumental mid-point mark in the 2018 season. For in-depth information on event details, travel, and more, make sure to head over to the official Event Hub at halo.gg/hcslondon2018. The HCS London broadcast will of course bring you all the action taking place on the Main Stage but will also feature live check-ins to other featured stations, red-zone style, providing viewers at home with more robust coverage of the most important matches happening at that moment. 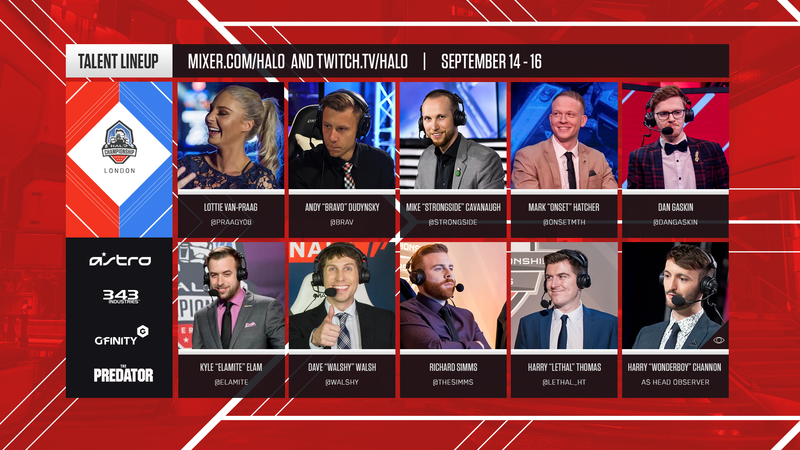 As always, HCS London will feature a world-class lineup of outstanding Halo broadcast talent, showcasing some of the finest casters and analysts in the sport. And of course, in addition to the on-air talent, we’ve also got another stellar observer team that will be 100% dedicated to bringing viewers at home the absolute best experience possible. 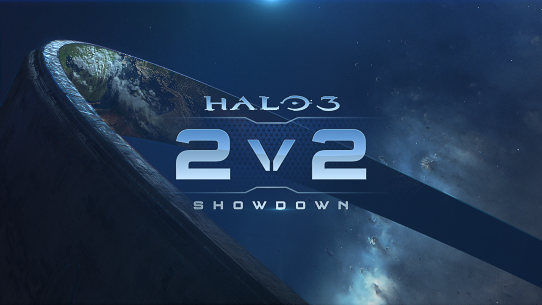 The incomparable Harry “Wonderboy” Channon is joined by Richie “Sherzy 1” Sheridan to provide viewers with enhanced angles and perspectives, bringing Halo esports to life in brand-new ways. 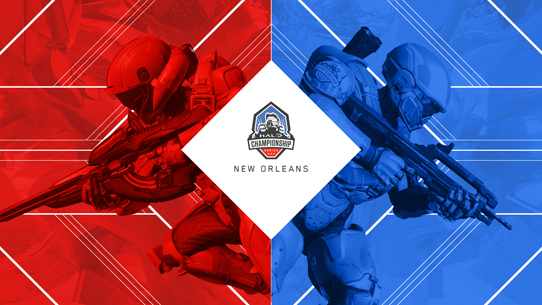 12 teams have been qualified directly into groups play based on a combination of results from both HCS New Orleans and performance in the online 2k tournaments leading up to the event. While online play is important, group play will help seeding for the championship bracket, and will provide top professional gameplay to watch right out of the gate! Teams that have registered for the event will battle it out in the Open Bracket, where only the top 8 teams will advance. In addition to the 4v4 action on hand, HCS London 2018 will feature a $5,000 FFA tournament taking place on Saturday, with action culminating in a 6-player Grand Finals event that will kick off our Championship Sunday broadcast slate. Updated Settings – During the offseason, the competitive game settings for the Halo Championship Series underwent a major refresh and update in preparation for the 2018 season. Three new Forge maps made by the community have been added, included Refuge, a remake of Halo 2’s legendary map Sanctuary. Additionally, Oddball has been added to the rotation bringing a whole new dimension to competition rotation. In New Orleans, we saw teams put these new additions through their paces for the first time. How will things change in London now that squads have had significantly more time to practice and prepare for the changes? Going Global – HCS London marks the first truly global open in series history, which means that North American teams suddenly find themselves in the position of adding jet lag, territorial unfamiliarity, and overall extra exhaustion into the mix when getting ready for the regular rigors of top-flight Halo competition. The world is watching to see how they will respond, and top European squads are looking to exploit any weakness possible in order to ascend the final standings. Historic Run – Emerging from New Orleans once again victorious, Splyce seem in many ways just as unbeatable as ever. However, their swampside success didn’t come without conflict, as the world champs found themselves needing to respond to an impressive bracket-resetting loss in the first grand finals series to rivals TOX Gaming. If there are any doubts to be justly levied in the snake-liveried squad’s direction, it’s questions of potential complacency that have most fans wondering how long the team can maintain its current stranglehold on the rest of the field. Team TOX – Once the all-conquering kings of Halo themselves, the quartet of Snakebite, Lethul, Royal 2, and Frosty left New Orleans frustrated at fourth straight defeat at the hands of Splyce, but not without confidence that they’re closer than ever to retaking the top spot. Reciprocity Revenge – After a disappointingly early departure from New Orleans, Reciprocity fans are still waiting on their clementine-clad heroes to deliver on the star-studded squad’s potential. Perennial legends Snip3down and Pistola (not to mention their coach OGRE 2) look to leverage the youth and sheer talent of the teammates Saiyan and Tripppey to finally bring home the hardware they were built to. Dark Horses – While Splyce, TOX Gaming, Renegades, and Reciprocity make up the general consensus top-four, many fans are keeping an eager eye on a couple of other squads that stand to pose the biggest threat to the proverbial establishment. The first of those is Excelerate Gaming (Artic, D3mon D, Ace, bubu dubu), who put the community on notice with their impressive run in a recent 2k, running up a 2-0 series lead on TOX Gaming in the grand finals before ultimately falling 3-2. They’ll get their chance to exact revenge on TOX Gaming early on in London, as both squads find themselves in Group B. The other North American team to keep a close eye on is Trifecta, who shocked many in attendance at New Orleans with a rousing run in the championship bracket – a run that included a toppling of the tournament’s number one seed, Reciprocity. Fans will be just as intently waiting to see if there’s a rekindled rivalry between Trifecta’s Ryanoob and Elevate’s Spartan, a volatile combo that was on full display following a Trifecta victory over Elevate on the NOLA main stage. Lucid Dreams – HCS London may be filled to the brim with international competition, but the battle for supremacy in Europe will be undaunted by the intercontinental interlopers. The number one EU seeded team Lucid are coming off the back of a disappointing performance in New Orleans, one that certainly has their rivals circling the waters ready to take them down. Jimbo and Mose will be looking for revenge on their ex-Infused teammates in the first tournament where both new lineups will be present. With the addition of Lunny and the experience of Riotz on Radient they would be more than happy to knock Lucid off their perch. Cold & Calculated – Another impressive EU challenger comes in the team form of Outcold gaming. Snipedrone, Qristola, Snakey and Shaady approach the tournament with nothing to lose, but everything to gain. If things click quickly for this talented group, they could be one of the most exciting teams to watch this weekend, as well as the team who ends up as the kings of Europe. Mock-It esports will also be one to keep an eye on, with this solid line up having multiple international events under their belts. They now just need to break out of the shadow of their peers with a big performance here in London. 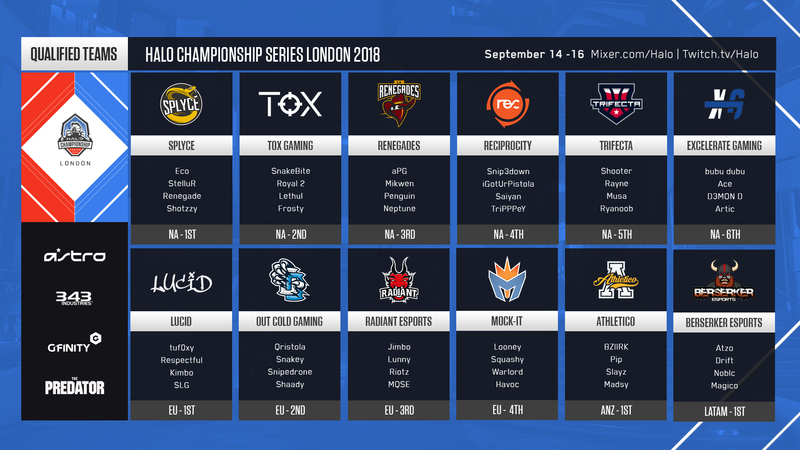 Swords of Berserker – Atzo, Drift, Noblc, and Magico head into HCS London under the radar, and looking to make another big impression. Not remotely content with being "just happy to be there," this fearsome foursome from Mexico is looking to prove that their fantastic Top 8 finish in New Orleans was no fluke. Down-underdogs – With a seismic power-shift happening in the Australian Halo scene, teams are looking to fill the void left by departing legends Benno and Voltage. A prime example of this in action is Athletico, who plucked the talented Madsy away from the HaloWC Sydney-winning Mindfreak squad to their own already impressive lineup of BZIIRK, Pip, and Slayz. 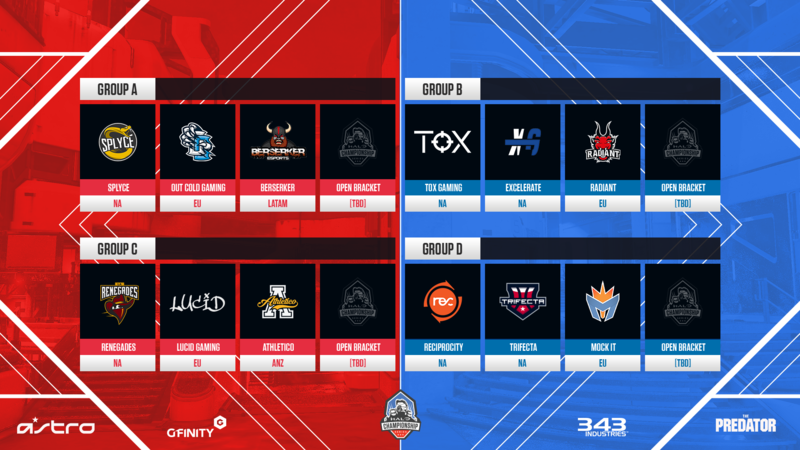 While the eyes of the Halo esports community is firmly set towards the United Kingdom this weekend, there's still no shortage of excitement building for the HCS 2018 Finals at DreamHack Atlanta this November, particularly in regard to the Halo 3 2v2 Showdown that will be taking place along side the Halo 5 championship action that weekend. Just yesterday, we unveiled a ton of new info for the tournament including details on settings, format, registration, qualifying and more. Make sure you check out all the info HERE. 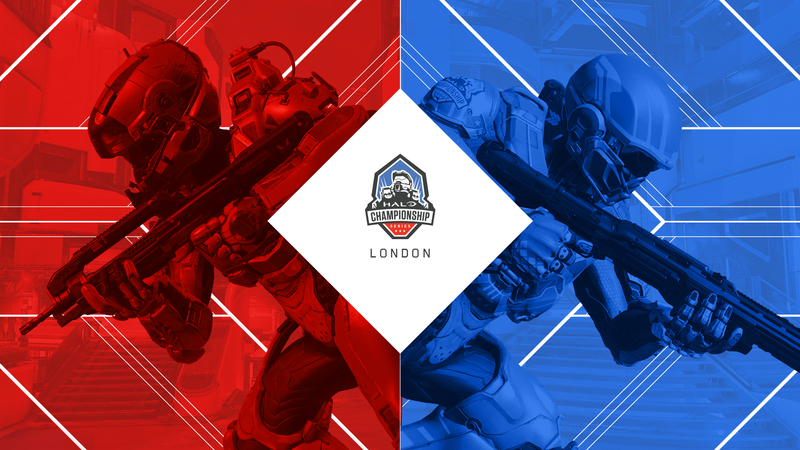 HCS London is primed to deliver another milestone moment in the annals of Halo esports. The action is nigh upon us soon, and we’re excited to share every moment of it with you! 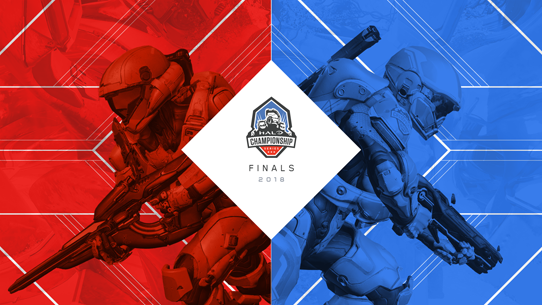 For all the latest on the Halo Championship Series, keep it locked to Halo.gg and follow @HCS and @Gfinity on Twitter. Plus, check out the awesome community-curated Halo Data Hive for updated player stats and match results. Congratulations to Splyce! The young guns proved they were more than worthy kings of the French Quarter. An amazing weekend was had at HCS New Orleans 2018 by MLG - let's recap all the action! 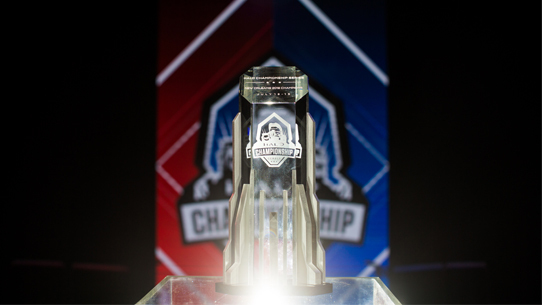 With the dust of the Halo World Championship firmly settled, and the spectacle of Splyce’s dominating run in our collective rear-view mirrors, all eyes have turned towards the Gulf Coast, where the next chapter in Halo esports looks to unfold at HCS New Orleans 2018 by MLG.